Obituary – Black, Margaret Ruth (Plumer) « Perry High School Alumni Association, Inc.
﻿- daughter of Mr. and Mrs. L. E. Plumer of Perry was was born on April 22, 1924, at Lucien. She has attended school in Perry for 11 years. Margaret was president of her junior class, and has been vice-president of the senior class, vice-president of the band and student band director. She was Confidential Observer in the Order of Rainbow and was president of Queen Esther in 1939-40. In addition to the other organizations, Margaret is a member of the Junior Home Culture club, orchestra, mixed chorus, girls’ trio and brass sextet. She appeared in both the junior and senior plays and played in the spring concert. Margaret was rated superior in French horn solo in the district contest at Tonkawa, in the tri-state festival at Enid and in the national conference at Stillwater. The brass sextet also won a superior rating in those same contests. She has been DeMolay sweetheart for the Perry chapter and was a candidate for basketball sweetheart. Margaret plans to enroll in the school of music at the Oklahoma A. and M. college next year. Margaret Ruth Black died at home of complications due to ovarian cancer. 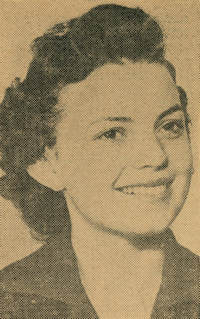 She was born near Perry, Oklahoma to Louis and Girtha Plumer. She was a music major at Oklahoma State University for four years and was listed in Who’s Who in American Colleges and Universities. In 1944 Margaret married Willis (Bill) Black and moved to Oregon where Bill graduated from OSU. They then moved to Cupertino, California and after eight years there, they returned to Salem where she taught piano and organ to mostly adults for the next 30 years. She played many concerts in Salem and surrounding areas, as well as being the featured organist at the Oregon State Fair for many years. She was the Capitol organist for the inauguration of Governors McCall, Straub, and Atiyeh. Besides her music, Margaret was also an avid golfer, bridge player and gardener. She was preceded in death by two brothers, Harold and Paul Plumer. Survivors include her husband, Bill; one daughter, Susan Price, two sons, Bill and Bob Black; six grandchildren; two sisters; and one brother. A memorial service will be held at 10 a.m. Wednesday, February 6 at Westminster Presbyterian Church, 3737 Liberty Road South, Salem, Oregon 97302. In lieu of flowers contributions may be made to the church or Willamette Valley Hospice, 2700 Market Street N.E., Salem, Oregon 97301. Arrangements made by Keizer Funeral Chapel.